Update: LG wasted no time giving us the what is it/where will it launch run around with a handset that first flew on the radar just three days ago. The Korean firm has announced the LG GX, a phone with a 5.5-inch screen, quad-core Snapdragon 600 processor and a 3,140mAh battery, according to Engadget. With a 13MP camera and 32GB storage, it falls right in line with the LG Optimus G. It matches some of the LG G2's useability features, such as integrating ability with LG smart TVs, as well, but buyers will only find the GX in LG's homeland for now. Large and in charge, a new big-screen LG smartphone appears to be on the way to make those 4.7-inch displays look puny by comparison. Pocket Droid has the spot on possible LG plans for a another big-screen smartphone by way of some mysterious printed materials. 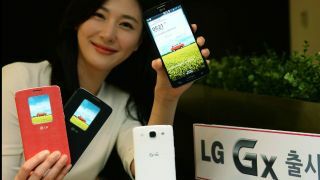 Referred to as the LG Gx, the leaked handset will reportedly come equipped with a 5.5-inch full HD IPS display, making it slightly larger than the 5.2-inch LG G2 and dwarfing the already expansive 4.7-inch display on the LG Optimus G.
That King Kong-sized screen lines up nicely against the LG Optimus Pro, the Korean manufacturer's earlier go at a 5.5-inch display. While full details are still elusive, the leaked LG Gx specs run circles around the Optimus line, with a Snapdragon 600 processor backed up by 2GB RAM and an extra-large 3,140mAh battery. Measuring 9.4mm thick, the LG Gx is also expected to come packing 32GB of onboard storage, LTE-Advanced data capabilities and a 13MP rear camera, in keeping with the "bigger is better" theme. That just leaves the question of when this unruly beast might come stomping into carriers around the globe, along with the rumor of a LG G2 Mini currently making the rounds. All signs point to a launch at the CES 2014 kicking off in Las Vegas next month, but eager buyers will likely have to wait even longer than that to actually buy one. It's not to late for gift buying, especially with TechRadar's Holiday Gift Guide!